The use of a wood deck brightener is needed for two main reasons. The first is that wood brighteners are designed to restore the wood's pH balance to neutral after using a deck cleaner or a stain stripper. The second is that the deck brightener will lighten the wood color making the stain look better and last longer when applied. The deck will need to be cleaned first with a wood cleaner or stain stripper. 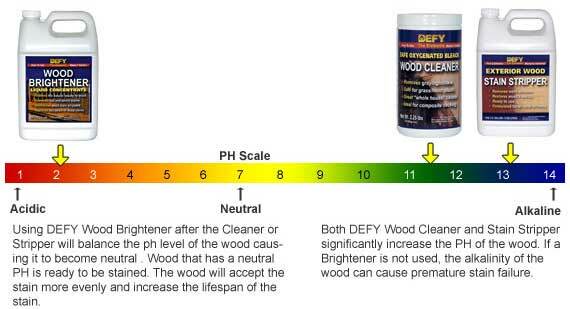 It is normal for the caustic in the cleaner or stripper to darken the wood's pH balance. Make sure that the wood is thoroughly wet and rinsed from dirt and debris. The wood brightener should be applied as soon as possible. Wear protective clothing, gloves, and eyewear. Mix deck brightener concentrates according to directions. Applying the wood brightener with a pump sprayer is the easiest way. Thoroughly saturate all wood. No scrubbing or pressure washing is needed. Take care to minimize over spray onto any plants and aluminum siding/trim. Wait 10-20 minutes. You will see the wood lighten in color noticeably. Rinse all wood when done. If you have any deck brightening questions please ask below. All questions are typically answered within a day. I would like to prep my new Cedar deck to stain. Can you recommend the best cleaner to remove the "mill glaze" and brightener that I can purchase locally from a hardware store? I am in a bit of a rush and need this weekend. We are in business to sell products from our website, not refer to local hardware stores. In addition, the products we offer are rated much higher than anything you can find at a local store. Where can I purchase wood deck cleaner, wood brightener and the proper final clear stain to retain the light color of the wood? I want to keep the wood as natural looking as possible. Thanks much!!! You can buy all those products directly from our website. Try TWP stains in the Honeytone or Defy Extreme in Natural Pine. Can I just wash my deck with soap and water and then apply wood brightener to lighten the color and then apply a natural wood finish? No. You need a deck cleaner and then a wood brightener for prep. I have some stains from metal and mold from vegetation on my PT deck a year and half old, never treated. It is mid October here in Durham NC several weeks from leaf falling, should I clean and brighten now and wait till spring to stain, try to do it all now, other words what do you suggest. Deck is about 1k sq ft. Thanks so much. You cannot lighten a deck stain without removing it fully first. Try a stain stripper or sanding to remove. Once removed you can use a lighter colored stain. I wish to lighten a deck I have just finished yesterday sealing with Thompson Waterproof Sealer. It has become too brown - not the neutral that I was expecting. I used the 'PLUS' - maybe a mistake. Wood is 6 years old - sealed once before. Was scrubbed clean. Prep with both a deck cleaner and wood brightener. Wait a few days then stain. I am staining an old pressure treated pine fresh water boat dock. I made the mistake of aggressively pressure washing with water using a fan tip. I have since sanded to remove the fuzzy wood and the old stain that didn't blast off. Please advise on the correct way to proceed. My client wants to use the same Cabot Australian Timber Oil Natural that he over applied three years ago and did not maintain. Yes you should apply brightener as soon as you are done with the cleaner. Let the brightener sit for 10-20 minutes then lightly rinse. Cleaners are applied first and are pressure washed off after 10 minutes. The cleaner does most of the work to remove dirt, mold etc. Brightener neutralizes the cleaner and lightens the wood color. How will a brightener work on 35 year red cedar shingle siding? I see in some of the comments that cleaning and brightening should be done one right after the other. Is this the process? or can the wood dry before brightening. Does the wood need to be rinsed after brightening and if so how long should the brightener be left on? In other words, what are your recommended steps from start of cleaning & brightening up to the point of staining? Thanks a bunch!! No stripping is needed but you do need both a deck cleaner and wood brightener. Use the Restore A Deck Kits for the prep. Stain with either oil based or water based. We have an old pressure treated pine deck that has not been treated in any way (except pressure washing) in at least 7 years, maybe more. Remarkably, its still in pretty good shape, so I want to re-stain and seal it. I'm wondering if we should bypass the stripping and go directly to the brightener and sealer? Also, would a water or oil based stain be best? Thanks. David, yes you want to brighten the same day as the pressure washing, while wood is still wet. Let dry for 48 hours before applying the stain. Hello, Can I apply deck cleaner and power wash deck? After power washing and complete rinse, can I go ahead and apply brightener the same day? Also, after brightening and drying...how long is too long before applying stain? Thanks in advance for a reply!! I have inside cedar (new wood) in a bathroom and purchased Defy Extreme Clear as a sealer for the test ratings against mildew, etc. Will this be sufficient to protect and how long should I let the cedar dry prior to sealing? It is clear 1x6 T&G. Do I really need to clear and brighten new wood as opposed to sanding? 1. No issues. Just wait until it dries. 2. Better to brighten all at once when done with all stripping. 3. 3 days should be good for drying before applying the stain. I'm using Restore A Deck stripper and brightener. Three Questions: 1) If it rains after the strip/brighten process, but before the stain has been applied, will that be a problem? I'm assuming the rain will not be dirty, and so I can just wait till deck fully dries and then apply stain. Right? 2) I'll be doing sections of a deck (strip/brighten, then strip/brighten adjoining section, etc.) I assume I should avoid placing stripper where I just stripped/brightened. But is a bit of overlap ok? 3) It's not hot summer, so will three days of dry weather be enough time to dry the wood... or should I just get a cheap water meter (do cheap ones work?) THANKS! Try washing with a pressur washer.